It’s early October, the rains have started in the Pacific Northwest, but my partner John wants to bag one last backpacking trip into the wilderness before winter sets in. This one would be into the wilderness surrounding Glacier Peak, the most remote of Washington State’s major glacier-clad volcanoes. The idea is to pack into Buck Creek Pass, normally a heavily traveled entry point into the Glacier Peak Wilderness Area but almost deserted this time of year. Once at the pass we planned to drop into the Suiattle River Valley at the base of Glacier Peak using a long-abandoned trail. From there we planned to explore the eastern ridges of Glacier Peak itself from a base camp on the Suiattle River. The whole trip would take four or five days. The weather reports advised that a weak front was pushing in from the coast, so we could expect some rain, but not heavy winds or snow. I met John at the trailhead after leaving the paved roadway at Lake Wenatchee and then bouncing along miles of rough dirt road. When I left my home north of Seattle it was raining heavily, but once over Steven’s Pass in the Cascade Mountains it was partially sunny and warm, the mountain range shielding the eastern side of the pass from the heavy rain pounding the western slopes. We started the hike on a beautiful fall day, but that would change later. Buck Creek Pass is a nine and a half mile hike from the trailhead. We decided to hike the first 6 and a half miles to the first night’s camp leaving the final uphill push to the pass for the next day. That made the first day’s hike pretty easy along a gently rising trail through woodlands punctuated by old avalanche debris fields, the surrounding mountains covered in fall colors of red, yellow and brown. We settled in for a comfortable night of whiskey sipping and storytelling, catching up with each other on the past year’s events. The next morning the clouds were lowering into the valley, but still no rain. We broke camp fresh and rested and made the 1,500 foot climb to Buck Creek Pass in less than two hours. 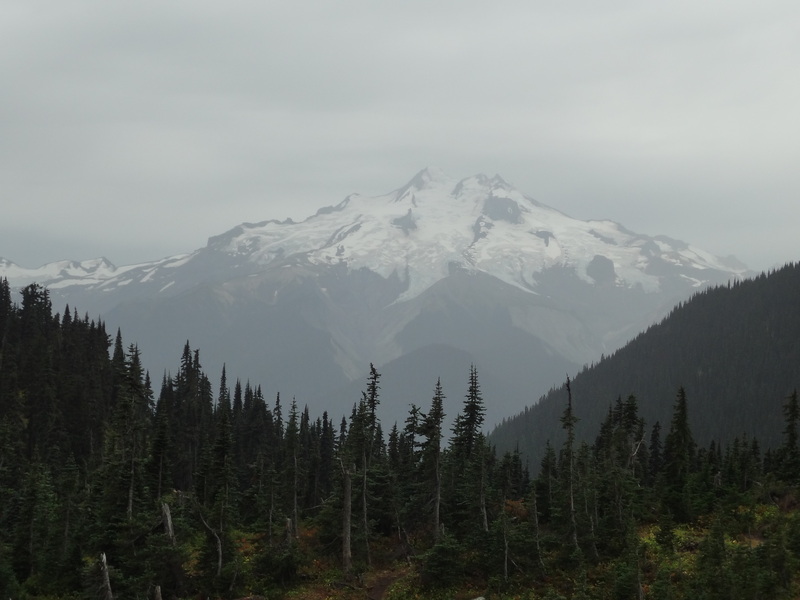 As we entered the Buck Creek Pass the massive cone of Glacier Peak came into full view, its glaciers clearly visible through the gathering mist and clouds. A fat marmot climbed onto a rock only fifteen feet from us, watching us curiously. From here we had planned to drop into the Suiatlle River Valley along an old, abandoned trail that we knew of, but an old foot injury of mine started giving me some pain and we decided to camp at Buck Creek Pass instead to rest my foot and wait to see what the weather would be before committing to the descent into the Suiattle. As it turned out, that was the right decision. We found a fine campsite near a dripping spring for water. We had the entire pass to ourselves. We finished out the afternoon by hiking up Flower Dome, a small peak near the pass with its summit without trees and covered in heather. In summer it’s covered in wild flowers but by now the flowers had fallen, replaced by the bright colors of red huckleberry leaves contrasting with the yellows and browns of dying ferns and low shrubs. From here the views across the Suiattle River to Glacier Peak are unobstructed – except for the clouds had now lowered over the volcano. Still it was beautiful with the fall colors stretching across miles of mountainsides, the clouds drifting through the forests, a group of ravens croaking from the trees. The weather was now deteriorating rapidly and a steady mist settled in. We returned to camp, cooked our dinners, sipped our whiskey and turned in early as evening time fell for a long night’s rest. It rained all night long. I awoke with my foot rested and ready to continue into the Suiatlle River, but John’s tent had flooded during the night, his goose down sleeping bag now soaked and useless (once down is wet, it has no insulation properties and takes days to dry out). Worse, he hadn’t gotten a good rest and was wet and cold. We assessed the situation. The abandoned trail into the river bottom was a difficult route with blown down timber across the trail, washouts and the track disappearing in places. So we knew that hiking on into the river bottom would be slow and put us out of range for hiking back out to the trailhead in one day – it would take two. The weather was deteriorating, windy and raining. I would have a limited hiking range with my foot injury and John’s gear was soaked, his sleeping bag useless. So, we decided to hike back out and save further exploration for another time. We hiked the nine and a half miles back to the trailhead through a light, steady rain. As I dropped off of Buck Creek Pass into the forest below a family of grouse trotted down the trail in front me, clucking and strutting along until they ran off into the forest. Halfway back my foot began aching again which caused me to take many short breaks along the way and slowing me up considerably. Despite the pain I thoroughly enjoyed hiking through the forest, but I was also glad that we had decided to hike out rather than push on deeper into the wilderness. Finally I reached my truck at the trailhead six hours after leaving Buck Creek Pass, a very slow pace. Even though we cut the trip short the beauty of the mountains and forests was magnificent and as I drove back from the wilderness I was glad we done this trip. Any day in the woods is always worth it and now, time to plan for the next one; a few days backpacking into the wilderness along the Pacific Coast of Olympic National Park –if we get a long enough break in the weather that is (it happens from time to time even in winter).